It all started when I was 9. My family wasn’t poor, but we also weren’t rich. I didn’t go to school barefoot, but I wish had. My parents couldn’t afford Nike, Adidas or Pumas, so they bought me shoes that looked similar to these name brands. The four-striped Aridas shoes that I wore so closely resembled the three-striped Adidas that my mother couldn’t tell the two apart. The problem was everyone in my fourth-grade class could tell the difference between finely sewn leather and poorly stitched vinyl. It’s not like I went to school with Miuccia Prada or Marc Jacobs, but I did go to school with kids who could count. The extra stripe on my shoes meant my dad had less money than their fathers. It was true. We had a home, but we lacked some of the luxuries in life like name-brand shoes and a linoleum floor. I’d overheard my mother saying she wanted to get a new kitchen floor, but my dad explained we couldn’t afford one. I wondered if he also got punched at work for being poor. Not that I knew what “linoleum” meant or what it was, but I could read. The new hardware store in our small town was having a grand-opening contest. One lucky customer would win a linoleum floor. It was as simple as filling your name out for their contest box. There wasn’t an age restriction, so I stole all of the ballots. Then I made a deal with my mom, if I could get her a new floor, she had to buy me a real pair of leather tennis shoes. It was either the power of positive thinking or the fact I knew the contest was rigged, but I made an excuse to get the family to the Ace Hardware store the night of the drawing. They called my name. We got the floor. The next day I proudly wore leather shoes to school and got punched because my denim jeans were from Montgomery Ward. We couldn’t afford Levis. While learning that “Rich people are mean. Always vote Democrat,” I also realized that some things in life are free. It’s all about contests, raffles and gambling. Well, the dice don’t fall too far from the craps table. Thanks to these vices, my dad and I have won a Porsche, $6,600 in a raffle and, in 1976, a linoleum floor. So, when my dad came to Salt Lake City, we didn’t go to the temple together or to The Gateway mall. We went to Wendover, Nev.
By learning to be a gambler at such a young age, I knew the best way to go to Wendover was to walk out my door a guaranteed winner. 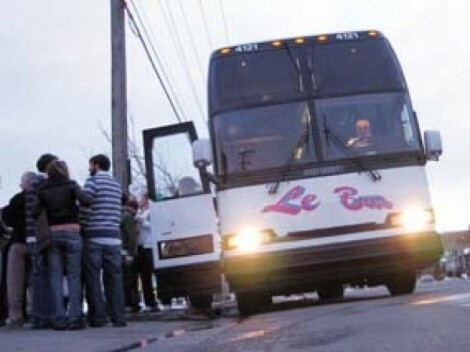 This means beginning our trip by riding Le Bus (975-0202, LeBus.com). Now consider the buffet. 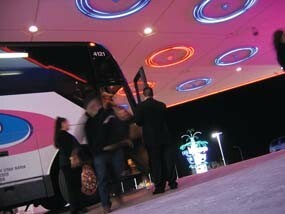 By riding Le Bus, you also get a free ticket to one of the casino’s gut-busting buffets. Most nights, a buffet dinner cost $15.95, and they’ll have all of your standard Chuck-A-Rama prime rib and potato fare. 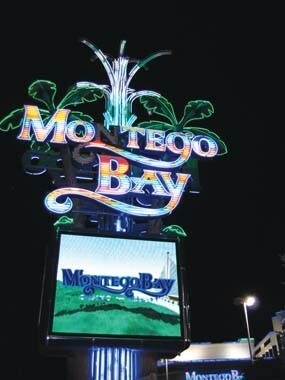 But on Friday nights, the Montego Bay serves up a $24.95 seafood crab-leg extravaganza. While there’s a $10 price increase for the common gambler, the price remains the same for Le Bus passengers: Free! As a youth, I had to stuff a contest box to be a guaranteed winner. Thirty-one years later, I still feel like I’m cheating the system by riding Le Bus and stuffing myself at the buffets. Luckily for the casinos, I lost $200 on this trip. Otherwise, I’d think the Montego Bay would be going out of business one Le Bus load—and one buffet—at a time.